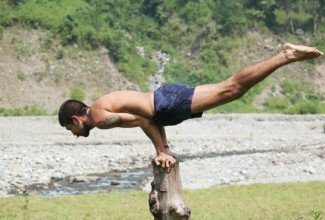 Jivan Chakra short courses are an ideal way to deepen and evolve your yoga practice without committing to a full teacher training course. The Hatha Yoga practice is the physical practice of yoga that uses posture, breath, and cleansing practices to prepare the body for meditation. 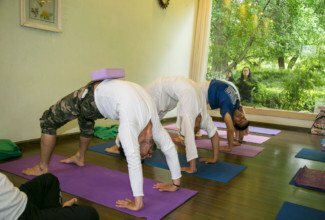 Our intensive workshops approach Hatha yoga traditionally as described in the ancient text the Hatha Yoga Pradipika. Included in the course is daily asana practice, pranayama class, yoga philosophy lectures, Yoga Nidra classes and meditation. Find out more about our short courses here. If you are looking to delve further into your yoga practice and experience the yogic lifestyle for yourself, our Intensive Course strikes the perfect balance between developing your personal practice and still having time to yourself outside of classes. 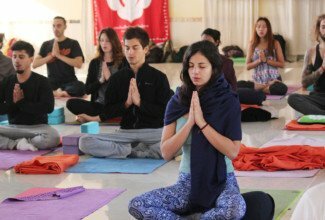 During the week long course, students rise early and begin each day with energising pranayama and Hatha asana practices before enjoying free time to take brunch and relax. Afternoons are made up of a rejuvenating yoga nidra class followed by a philosophy lecture. Finally the day closes with an evening meditation/mantra session perfect for quieting the mind before getting a good nights sleep ready for the next mornings classes! Skilled, safe adjustments are a fundamental part of creating an exceptional yoga class, and an understanding of how the body works and common alignment issues is invaluable for every yoga student. The Jivan Chakra Art of Adjustment course equips participants with asana adjustments, vocal cues and how to address individual body types in a wide variety of asanas. Pranayama is the practice of controlling the breath, which is the source of our vital energy. This practice works on the gross physical body, mind, intellect and deeper states of consciousness. Through pranayama, we tap into the parasympathetic nervous system, which is responsible for activities that occur when the body is at rest. Pranayama is a means of attaining higher states of awareness and quieting the mind. 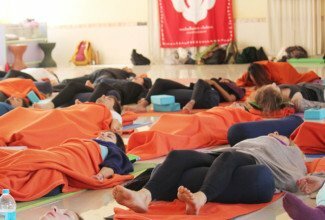 Yoga Nidra is an ancient technique of self exploration and inner growth. 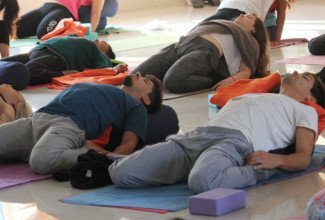 During the practice, you lie down in a restorative relaxed position and are guided through visualisation exercises and techniques to increase body awareness. This powerful practice moves you deeper into the subconscious and works to process unresolved negative thoughts, habits and emotions. The practice is suitable for practitioners of all levels and leaves you feeling rejuvenated and emotionally balanced. Deep relaxation, Self Awareness, Acceptance, Forgiveness, Gratitude and Surrender form the process in which deep healing takes place. Our healing sessions are Holistic, drawing from Eastern and Western approaches. The healing allows the individual to confront emotions they have been holding onto in a timely manner. The benefits are to live in abundance of physical/mental heath, higher quality of life and peace of mind. Meditation is practiced to increase self awareness and quiet the mind. All yogic practices are preparation for meditation, which is seen as the way to self realisation. 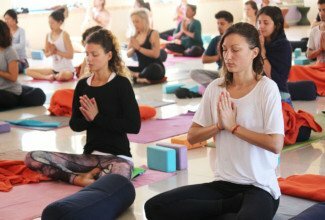 At Jivan Chakra, students are exposed to several techniques, ranging from mindful, guided, cleansing and concentrative practices. Mantra chanting is also practiced during these sessions. Combining breath, sound and rhythm, students channel the flow of energy through the mind-body and restore common nervous system imbalances.